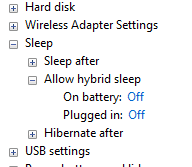 Hybrid Sleep feature in Windows provides a safeguard for computer system such as desktop PCs and workstations, which does not have backup power supply such as battery, from losing running programs and open files when encountering power blackout while in sleep state. The trade back is that to let computer goes into sleep takes a while longer, as system will save the state of operating system environment into memory as well as hibernation file (hiberfil.sys) as in the process of hibernating so that unsaved data won’t disappeared if power is cut. However, for users who has UPS, or using laptop or notebook computer which has batteries to fall back on power outage, Hybrid Sleep is not necessary, as most system with backup power is configured to shutdown automatically or goes into hibernation when the battery charge level falls below certain critical level. Thus, the Hybrid Sleep is not necessary needed for such system to speed up and reduce the time system used to go into sleep state. If your system has a lag or delay before sleeping (such as when closing the lid of laptop), try to disable Hybrid Sleep to see the sleep performance is improved. Click on Start button (or Win-X Power User Menu in Windows 10 / 8.1 / 8), then go to Control Panel . Click on Change plan settings under the active selected power plan, i.e. the one which are ticked. For desktop computer relying on AC power, select On from the drop-down list of “Settings” option. On this system on direct current, it’s best to use Hybrid Sleep to ensure that system state is intact when memory is losing power. For notebook and laptop computer or probably those on UPS, there are 2 settings available – “On battery” and “Plugged in”. Select Off from the drop-down list as the value for both options.